We present a new method for picking objects through quasistatic in-hand manipulation with endeffectors that have no degrees of freedom. Our stable manipulation/ grasp planning is achieved with two contacts at fixed distance and the force of gravity, and is provably complete and correct. Practically, our robotic in-hand manipulation technique can facilitate low-cost manipulation and render simple endeffectors such as the parallel-jaw gripper more dexterous in picking, placing, and handing-off objects in case, for example, failing actuated grippers become frozen and it is impossible to exert sufficiently large internal forces. Our picking technique can also be applied to placing objects. Implementation and experimentation on a custom-made direct-drive manipulator and a conventional manipulator are presented. Many experiments were performed for both picking and placing and the results demonstrate usefulness of this method for manipulating a variety of common objects, with different geometries and surface conditions. 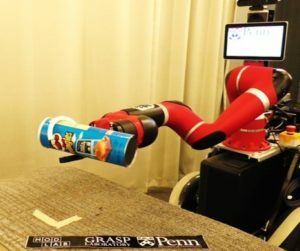 We presented a robotic in-hand manipulation technique for picking and placing objects that takes advantage of two non-antipodal contacts at fixed distance and gravity. Our manipulation technique can be applied to a wide range of objects and robot platforms and is less dependent on exact contact positioning and sufficiently large internal forces. Experiments with a custom-made autonomous manipulator and a conventional manipulator had high success rates for picking and placing several objects on different surface conditions. While in principle this approach can work on a large variety of object shapes, rigorously determining the space of all object geometries that will practically work (such as those elongated shapes addressed in our experiments) is left for future work. We are planning to generalize our technique with additional sensing modalities, more dexterous in-hand manipulation skills, and more expressive contact models. Mar 14, 2018 | Filed under Locoma, Manipulation and tagged with caiomucchiani.